Employee turnover is something all companies should pay attention to, because the effects of turnover will be different for every organization. Some degree of turnover is unavoidable, and eliminating turnover altogether is unrealistic. That being said, it’s important to figure out the balance of departures and new hires that works best for your company. We want to help you understand the types of turnover and their implications, and offer tips on reducing your turnover rate. 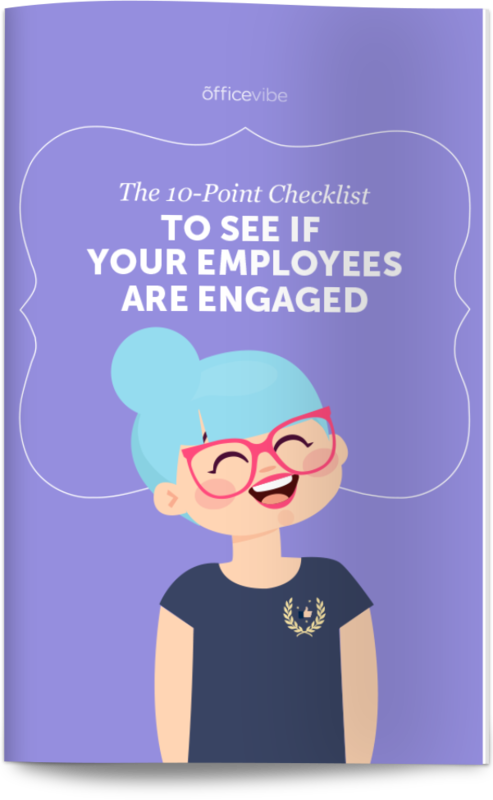 Reduce turnover with this complete checklist of the 10 most important things you need to do to keep your employees engaged. A simple definition of employee turnover is how many people leave an organization and are then replaced by new employees in a given timeframe. Usually, turnover rates are calculated by a fiscal year. Employee turnover can have certain negative impacts on a company, which we’ll get into, but it isn’t necessarily all bad. There’s a distinction to be made between voluntary and involuntary employee turnover. Voluntary turnover happens when employees are replaced after leaving by their own choice, and involuntary turnover happens when employees are replaced after termination. Turnover is considered undesirable when a company loses high performing and otherwise valuable employees and replacement is difficult and expensive. On the other hand, turnover is considered desirable when a company loses underperforming employees and replaces them with employees who will improve output. Is Employee Turnover Good Or Bad? As you can see, there are a few factors to consider when assessing your organization’s turnover and whether it’s positive or negative. Ultimately, it isn’t just about how many people leave, but who is leaving. Context is key to evaluating your company’s turnover rate. There are many causes of employee turnover, but an overarching factor is employee disengagement. Two areas that can have a big impact on turnover and retention are hiring practices and management. A big part of why employees might leave and need replacement is that they aren’t the right fit. That’s why it’s important to make sure you’re hiring the best candidates not just for the position, but for the company. Of course you want candidates to be qualified, but you should also consider things such as cultural fit and company alignment. Technical skills may be key to performance, but motivation and a sense of purpose are key to engagement. Getting the right people into your organization is step one, but it’s also about keeping them there. You’ve probably heard it before, but most people don’t quit their jobs, they quit their bosses. In fact, 75% of employees who quit their jobs quit because of their manager. Employees need support and guidance from their managers, which is why effective leadership is so important. This relates back to hiring, because it’s important to make sure that the right people are being hired or promoted into management positions. Being a manager is about more than being an expert or star performer, it’s about having the emotional intelligence necessary for people management. Proper training and coaching are essential to successful leadership, and making employees feel empowered and supported. Managers should be given resources to improve in their roles and encouraged to seek growth and development opportunities both inside and outside of the company. Now that you have a more nuanced understanding of employee turnover, let’s take a look at the current state of employee turnover and retention in the workforce. More than ¼ of employees are in a high-retention-risk category, and many of them are top performers with critical skills. 44% of employees say they would consider taking a job with a different company for a raise of 20% or less. More than 70% of high-retention-risk employees say to advance their careers they need to leave their company. Employees who are “highly engaged and thriving” are 59% less likely to look for a job with a different organization in the next year. 15% of employees do not see themselves working at their company one year from now. 51% of workers are looking to leave their current jobs. Employees feel that they have to leave their companies in order to grow. This is a shame, because the longer an employee stays in your organization, the more of an asset they become. Opportunities to evolve within a company are essential to employee retention. Looking at the types of turnover and the underlying causes of it gives context to your company’s turnover rate and helps you to understand its implications. That being said, it’s important to look at the numbers to get an idea of where you stand. The number of employees that you ended the year with. Start by adding the number of employees that you started the year with and the number of employees that you ended the year with, and divide that total by 2. Then, divide the number of employees that left in the year by the outcome from that first equation. Multiply your final outcome by 100. Not a math person? We’ve broken it down for you with an example. Suppose you start the year with 200 employees, and 30 of them leave throughout the year. During the same year, you hire 25 new employees to fill in the gaps, leaving you with 195 employees at the end of the year. Your turnover rate would be 15%. According to Gallup, 10% would be the ideal rate, but of course this will vary from company to company. The best thing to do is look at your own organization’s rate over time to get a sense of your average, and do research on average turnover rates in your industry. Every time you have to replace or hire a new employee, it costs your organization money. Essentially, keeping a high performing and engaged employee is more cost effective than bringing on someone new. Beyond the financial implications of employee turnover, though, there are impacts on the company and your other employees. Losing an employee can decrease morale among the remaining employees. When an employee is terminated, it can cause anxiety among the rest of the team if they fear that their positions may be at risk, too. On the other hand, when an employee leaves by choice it can sometimes cause a domino effect if the underlying causes for them leaving are impacting other team members. This is why it’s essential that transparency and open communication between employees and managers is encouraged, especially in relation to employee turnover. As the saying goes, prevention is the first solution. Focusing on employee retention by increasing engagement and growth opportunities will help you to reduce your organization’s turnover rate. The hiring process is where it all begins, so it’s important to get it right. Ask questions about who your candidates are as people in your interviews, not just their technical experience, and have them perform a “work sample” test with a few members of the team to see how their skills and personality integrate. Having a more thorough hiring process will benefit you in the long run. As much as 20% of employee turnover happens in the first 45 days, and a big part of that is due to an improper onboarding. Be sure to set proper expectations, make them feel welcome, collect feedback and touch base with them often with weekly check-ins. Try having a team lunch within the first week of onboarding a new employee so they can get to know everyone. If employees don’t have a clear vision of their role, it can lead to disengagement and underperformance. Making sure that each employee has a mutual understanding with their manager of their roles and responsibilities is crucial to keeping them on track, and keeping them around. Of the new managers we recently surveyed, 66% said that they did not receive any training or coaching before starting out as a manager. Offering training for managers is one of the best ways to ensure that they are a successful team lead. Some people may be born leaders, but there’s always room for learning and development. What employees really want, as made famous by Dan Pink, is autonomy, mastery, and purpose. You can provide these things for your employees by empowering them to take charge of their own work and offering skill development and training. Having a clear company mission and company values will help employees feel that they are a part of something bigger, giving them a sense of purpose. Recognizing employees is such a simple way of boosting their motivation and engagement, and making them feel valued. Employees also want to receive recognition from their coworkers, so setting up a platform for kudos is a great initiative to boost morale. Work-life balance is one of the most important parts of keeping your employees happy, healthy, and productive. Be flexible with employees working remotely and ask new hires what the most important thing in their personal life is and how you can accomodate them best. Employees want to feel listened to and have validation that their opinion matters. Checking in and seeking feedback on a regular basis allows managers to detect problems early and implement solutions. Collecting regular feedback with your team is easy and automated with Officevibe, a FREE tool that helps build stronger leaders. Do you have any thoughts on employee turnover to share? We’d love to hear. Let us know in the comments below. This article was originally published by Jacob Shriar on April 18, 2017.